Model CLS Capacitance Level Switch provides reliable point level measurement of solids, liquids and slurries in metallic or non-metallic tanks and vessels. Model CLS detects the presence or absence of material in contact with the probe by sensing a change in the capacitance. Electronics provide highly sensitive measurement detection (requires less than a 1 picofarad shift from ambient). State of the art technology ignores material build-up on the vessel sidewall or along the probe assembly. One time calibration is simple with a single multi-turn potentiometer. Red LED on housing indicates sensor status. Unit features an adjustable 1-30 second time delay and a 5 amp, SPDT fail-safe relay output. 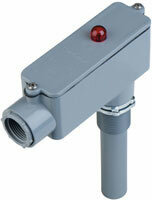 Model CLS can be mounted vertically or horizontally. Service: Solids, liquids, or slurries. Temperature Limits: Probe: -40 to 240°F (-40 to 116°C); Electronics: -40 to 185°F (-40 to 85°C). Enclosure Rating: NEMA 4X (IP56), PVC, dust tight, water resistant. Electrical Rating: 5A @ 250 VAC. Power Requirements: 120 VAC, 1.5 VA.
Conduit Connection: 1/2" female NPT. Process Connection: 1" male NPS. Mounting Orientation: Vertical or horizontal. Sensitivity: Adjustable to <1 pF. Time Delay: Adjustable 1 to 30 seconds. Weight: 2.0 lb (0.91 kg).